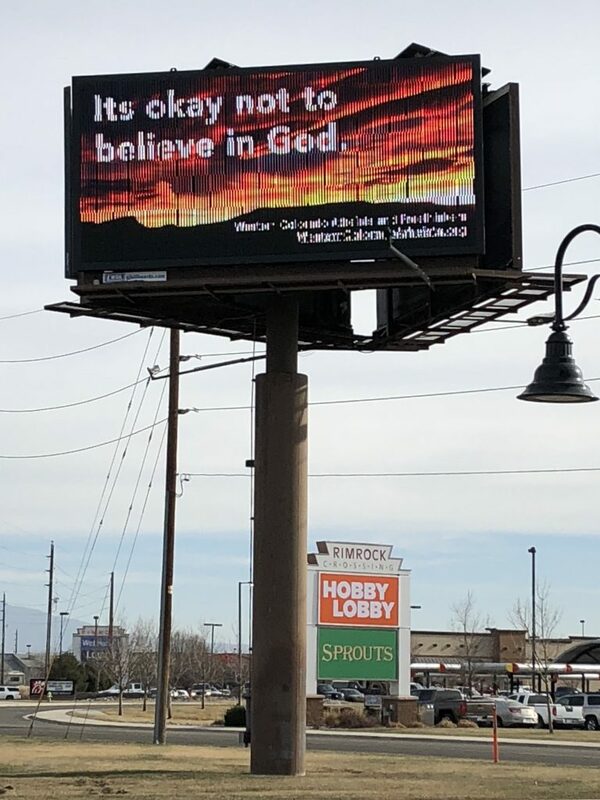 In another sign of how Mesa County’s culture becoming more diverse and welcoming, a bright digital billboard is greeting people entering downtown Grand Junction and reassuring them it’s okay if you don’t believe in God. 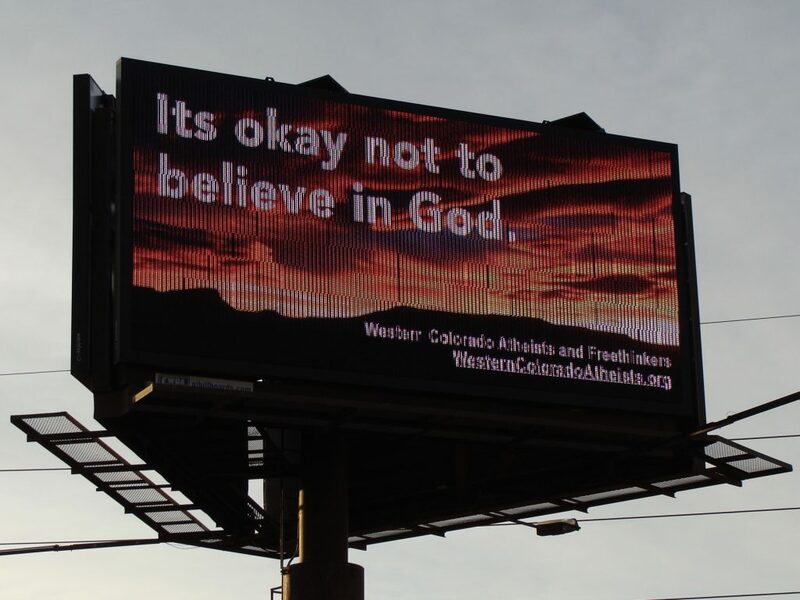 The billboard, located on a busy section of I70-B by Rimrock Marketplace in front of Hobby Lobby and Chick-Fil-A, was put up by Western Colorado Atheists and Freethinkers (WCAF) as a big a “thank you” gift to all the people in western Colorado who have had the courage to come out as atheists in the last year. It’s also a celebration of the progress made by western Colorado’s growing secular movement in advancing rational thought and reason in all our endeavors. WCAF is a Colorado and IRS-registered 501 (c)3 charitable educational group that promotes atheism as a valid belief system, works to preserve the separation of church and state locally and provides a way for people who don’t believe in a God or gods to meet up with each other, support each other and enjoy some fun, learning and fellowship together. The group meets monthly. If you are an atheist, agnostic or other non-believer and want a little thrill and some reassurance at this time of year that it’s just fine if you don’t believe in God, take a drive by the sign, bask in the warmth of it’s reassuring message and forge ahead with enjoying the winter solstice season! Perfect. Perfect location. I’m still LOL! !